Implementing a sound security technology solution has never been more important. Yet making informed decisions can be overwhelming considering all the available security technology options. Regardless of how advanced or expensive, any security technology is essentially rendered useless if no one knows how to properly use it. As an example, in February 2018, we learned during the Stoneman Douglas High School shooting that that an individual using the video surveillance system to inform first responders of the shooter’s location was mistakenly viewing pre-recorded video. This person assumed they were accessing the video surveillance in real time, but the shooter had already left the school campus. Emergency personnel were prevented from entering the building based upon this inaccurate information. It also has been reported that only one school resource officer had experience in the practical use of the school’s surveillance system while not even one staff member from the county sheriff’s department had any prior knowledge of the system’s existence or operation, nor location of surveillance cameras. No matter the setting — school, hospital, retail, office, etc. — purchasing a security solution is only half of the solution. Staff members selected to use these systems must be proficient in operating them, which requires training to be the number one priority. 1. Find solutions that can become an integral part of your day-in/day-out business. 2. Weigh technology versus ease of use — you need to find a system that will provide the protection you need, but also will be easily utilized by on-site staff in an emergency situation. 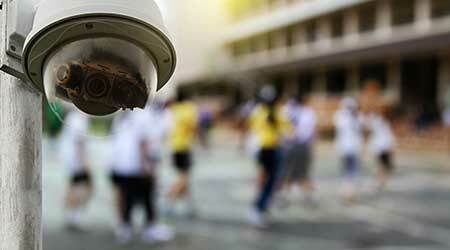 Real-time surveillance is a necessary and important aspect of any facility’s hostile event response program. It is critical in assisting law enforcement in tracking the movements of an active shooter. Strategically located surveillance cameras can help first responders create the best plan for response. 1. Locate cameras that take into account not just the need for forensic video but the ability to track individuals throughout your facility. 2. Make an integral part of the final solution multiple methods to administer and gain access to the system, i.e., wi-fi, cell phones, personal computers, remote access, etc. 3. Implement a plan that requires the continual testing and, when possible, use of the system developed with all parties and stakeholders. Lastly, NFPA 3000 (Standard for an Active Shooter/Hostile Event Response (ASHER) Program) currently is out for review. This is a valuable resource as you consider your options. Paying attention to their recommendations will help save precious time and lives. An experienced systems integrator can help you develop a solution to address your specific security concerns and priorities. Greg Hussey (greg.hussey@signetgroup.net) is vice president of engineering for SIGNET. He is a security expert who has worked for SIGNET for more than 25 years.